Start your French journey the right way with this French audiobook featuring a simple, yet real-life like story and very clear explanations of fundamental French grammar, vocabulary, and pronunciation + practice exercises. Almost 8 Hours of story chapters + study guide + grammar and vocabulary exercises – all professionally recorded by a Parisian native + 141 pages PDF transcript. It is not easy to learn a new language. I like the structure of this learning tool. The dialogue, practice, and practical suggestions provided in the audio and book make daily study enjoyable and productive. The audiobooks are very clear and easy to follow. For myself, able to listen to and read the script at the same time is an effective way to learn a new language. Even though there are many audiobooks out in the market, the à Moi Paris series has a storyline that is interesting and it covers day-to-day encounters. The books also give you tips for some tricky pronunciations. I highly recommend these books to those who struggle in French pronunciation and who do not find traditional classroom learning is effective to try on this series. The audio book is wonderful. I love the way I can play little bits at a time when I have some time. Camille explains things in such a clear way. Other apps are based solely on repetition and don’t explain the points of grammar at all. As beginner, French can be overwhelming to learn. Camille makes it easier by breaking down all the components of the language. French Today is NOT the typical classroom French but the lessons are designed to be practical for everyday, street French. Text book French is not what you hear in France! French Today gives the student enough information to understand grammar and sentence structure (textbook stuff) but does so for how it is spoken. Camille teaches how to pronounce French, which I highly recommend starting on the lesson first. Most students, including me, don’t pronounce properly, so being understood by a French person will not happen. You will sound French if you follow her lesson. All lessons provide different speeds so listening does not become frustrating. Learning to hear normal speaking speed will come over time, and the lessons provide this opportunity. Finally, Camille always tells us the key to learning: repetition! The cost is low and definitely worth it. You can learn French with French Today! Such a great system for learning a language. And Camille is right – repetition, repetition, repetition, out loud – is the key! Very thorough, and enjoyable way to learn basic phrases and French customs. The three speeds are great to learn with. Learning French words is easy. Learning how to understand spoken French is much harder. This audiobook has helped me get to that next level and it’s been a worthwhile investment. I learnt French to GCE at school and read some French (mainly technical) during my working life. On retirement, planning to spend time in France, i completed a BBC course followed by an Open University course. I got by, because, while my spoken French was not great, my written French was good. However, as I spent time in France, I found few French understood me and I did not understand them (no problem in hotels, restaurants and I could get by at the Town hall, but casual conversation was a problem). I considered looking for another course in England, but then, I could already understand English people speaking French – it was conversation with French people that was the problem. When I cam across French Today, and the distinction it draws between spoken French and written French, I thought this may be the answer to my problem. I started by buying À Moi, Paris level 5 (I thought I was passed that level with grammar/vocab, but some revision would help). However, it did not work for me. I decided I should try the series approach to pronunciation from the beginning and went back to Level 1. I am delighted. It seems to be working for me. The clear explanations of liaisons and glidings in spoken French make sense to me. I am enjoying the course, believe my spoken French is improving and as well as revising some french idioms, I am already appreciating new ones (e.g. a subtle distinction between ‘je t’aime’ et je l’aime beaucoup’ I had never suspected. So, too soon to be sure, but the approach seems to be what I need, the explanations clear and precise, and I am enjoying it. If you share my problems with spoken French or wish to avoid them, I would recommend you try it. Wonderful instruction!! Easy to listen to and to use! I love the Frenchtoday site. Camille, Olivier, and Leyla are so very kind and friendly and generous with their knowledge. Also, do take a look at Leyla’s use of Minecraft to teach us all, too!! Her excitement is catching! I have been following French Today for quite some time on Facebook and have found the articles and topics presented very informative and complimentary to my French lessons. Keen to improve my listening skills, I have recently embarked on À Moi Paris Level 1 which I am finding very helpful. Simple sentence structures are helping me build vocabulary and become more confident and familiar with “street French”. The story chapters are interspersed with helpful grammar lessons and questions about the story you have just listened to (asked in French). I am thoroughly enjoying the journey. It is so difficult to find someone to talk so I can listen, and I LOVE this product. I go for walks every night and listen over and over. Because it is a story it doesn’t get boring like memorizing random phrases. I wasn’t sure it would work, but my ear and my understanding have improved so much, it shocks me. And the conversational style is so current and nothing like things I learned in school or have taught myself. And I am not young! So there is hope for all of us. And I have thrown money down on lots of French things, but this one is actually changing me. I’m pretty happy. It’s on the easy side for me. However, I needed to review some grammar rules and mostly listen to the way French is pronounced in reality. Thank you for your fine audiobooks, I just wish that I had found them sooner! I find learning a new language very difficult but with this audiobook it is helping my pronunciation and my french vocabulary. The story is about everyday things which is also very helpfull. My husband is on book 6 (which shows how slow I am) and has also found the series very helpfull & enjoyable. I am in France now on my first immersion trip at Belle Isle en Mer. I found the info through Frence today. It is truly an experience of a lifetime. J’adore la France ! I have purchased the first four books in this series and they are invaluable. Camille’s explanations are clear. She and Olivier want you to be successful. Follow the instructions and you will learn French the way native French speakers talk not the way schools and text books teach the language. Bravo French Today, I am passionate about one day becoming fluent in my second language, le français. Merci beaucoup ! I have a few of the audio books and they’re amazing. So good’. Detailed. Fun and I enjoy listening to them all. It was good to listen to the slower versions first and then move on to the faster versions. I learnt a lot that way. One cannot do better than with Camille’s teaching!!! Very clear!! Plenty of time to one’s part!! Excellent ! Meci Beaucoup ! I learnt basic French in school many years ago and always wanted to learn it so that I could speak it fluently. I have been learning French since just before Christmas and enjoyed the Free Audi book so much that I decided to invest in the Audiobook series. Camille teaches in such a friendly way that it makes you want to do your very best. I like the way she explains everything in full so that it all makes sense. I also subscribe to the Newsletters which are also really interesting in that there are stories about different towns in France and their customs also a little bit of history. I have checked out several courses but have found this one to be by far the best. Merci beaucoup Camille, Olivier et Leyla. I have bought this series of audiobooks to reinforce my French language classes. Camille is very clear in her explanations and she has certainly helped me understand sentence structure and pronunciation more effectively. I like having the street French option. I love this! Camille understands the absolute beginner and launches the course from the very beginning to make success possible. I find French more difficult to learn due to its written vs spoken pronunciations, but Camille helps de-mystify many of these issues. Plus, she is engaging and has created a story line to keep interest up. The free app they have makes everything easy to use and accessible from one’s phone anywhere. Try it, you’ll like it! FrenchToday is one of the best French learning resources around – I am so glad I found it! I have been studying French for a few months now, but I decided to start out using Level 1 and using the “Street French” speed. Listening at this speed definitely increased my understanding of French. Camille’s explanations after each lessons are very helpful, much clearer than what you will get with textbooks or other resources. The app is definitely what elevates this from “great” to a “must have” when you’re learning French. Instead of getting just PDFs that you have to open on your phone or that you have to print out, the transcripts of the lesson is in the app so you could follow along very easily. Added bonus – you can hide the English translation of the text! The fact that the app is available not only for iOS/Android but also for Mac/Windows is a nice addition since you can easily continue your French learning on your different devices. Merci beaucoup Camille & Olivier! FrenchToday is a gift for us language learners! I like the method but as an absolute beginner I find, in the story chapters, that jumping back by 15 seconds of audio is too much for my brain to listen and repeat successfully. I’d like to see an additional repeat button which is just 5 seconds which is say 10 words or about one sentence. I have been learning French for the past three years, attending a U3A class once a week and by means of another electronic product, and now know quite a lot of vocabulary and understand much of the grammar. With the help of a dictionary I can write and be understood by my French friends in Bretagne. However, I had almost given up hope that I would ever be able to understand spoken French or participate successfully in French conversations. Having just finished working my way through À Moi Paris I have new hope. I look forward every day to the times I will spend working with Camille and engaging with the characters she has created for the novels and, although I find the glidings, liaisons and elisions very difficult, I am confident that by the time I have completed the course and perhaps attended an immersion home stay I will have the confidance and ability to participate successfully in day-to-day French conversations. So a very big ‘Thank You’ to you Camille and your team. After several attempts to learn French I searched on the web for a comprehensive language course that offers a structured way of studying for beginners. I found ‘French Today’ and was impressed by the very unique way they tackle this. I didn’t think twice before I ordered the whole beginners package as they offer a full refund if you are not content with what you’ve bought. I am moving quite slowly but steadily and I am very pleased with the method. To support my studies I recently also ordered the first three drill packages and enjoyed the first session today. The whole course programme is very well conceived interestingly structured in stories and also available on an app, which I mostly work from. I can highly recommend this course and am sure that it is not only valuable to beginners. 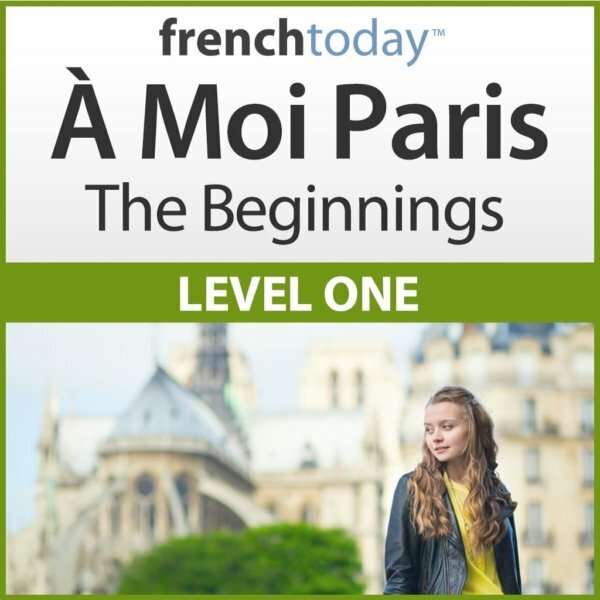 I am starting my journey with FrenchToday…have listened to Camille’s Introduction, Grammar Lexicon and the first Story and Story Guide…very excited about the thoughtful way this course/experience has been created and recorded! Also, had an outstanding customer service experience…Olivier personally responded to my question with the answer. All my life I have wanted to learn French. Over the years I’ve bought books and tapes and CDs, and even worked my way through an online French program. I’ve learned a bit about the language but never how to actually speak it. French Today is totally different — the concept that spoken French is not the same as the written language is SO useful, but the biggest help for me is having everything in slow, normal and fast speeds to listen to, and having a format like an audio novel that makes the material interesting. Also, all the extras — the blog, the videos, the emails — help support my practice and keep me engaged. I’ve learned a lot about French culture, and really enjoy the humor. Not to mention that Camille has a beautiful voice. Absolutely wonderful, merci Camille et Olivier! If only I had found this course years ago!!! It is by far the best I have seen in over 20 years of studying French. I have purchased the whole series and am now able to fill in so many gaps in my studies and improve both my speaking, comprehension skills that were missing! The investment Is well worth it. The content is detailed, well constructed, interesting and relevant for anyone learning French in our world today. I hope schools will revise their methods so that children will enjoy French lessons a lot more. Thank you Camille. Merci mille fois. This app is a must have for French Today Audio Books. It transforms your learning experience into playtime. No more fumbling with navigating PDF readers, audio players, and explorer to change speed and chapters. Very clean user interface that does everything you can think of, including the magical 15-second forward and back, sync PDF to audio button, and simple speed selection. This is truly the ‘free razor’ and should sell Audio Books like hot cakes (les gateaux chauds). The French Today product range is very clear and easy to understand and follow. There are three recorded variations for each chapter of the story part (Slow, Normal and Street French) which really helps with perfecting your pronunciation and understanding different types of spoken French. An excellent product which I highly recommend for anyone wishing to sort off right in French. 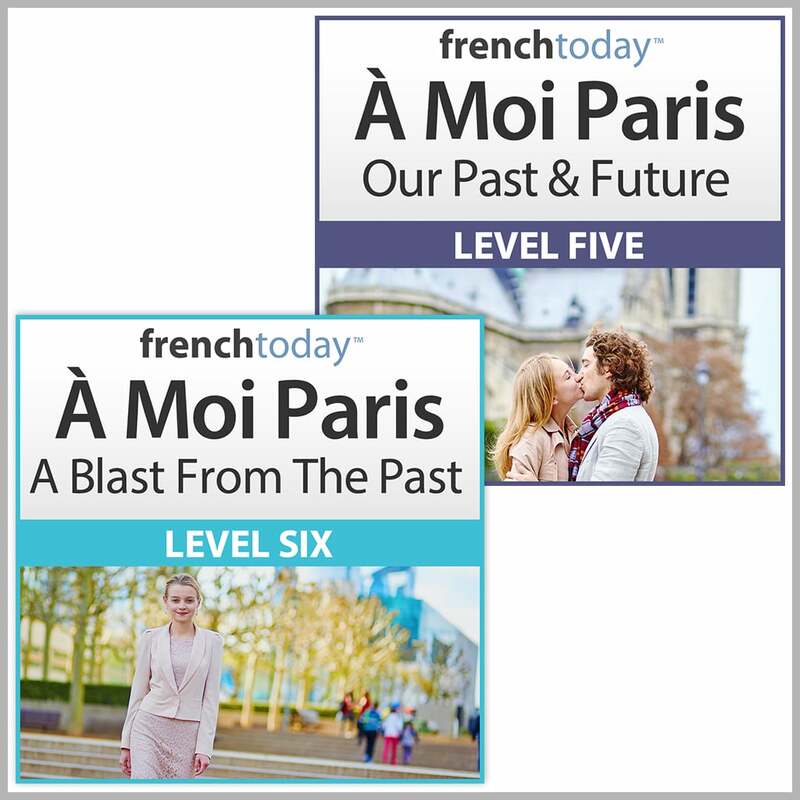 I’ve studied Rosetta Stone thru level 2 and find the A Moi Paris Level 1 to be an enjoyable, informative listen. I especially appreciate the ability to listen at a very slow pace for a first time through and then faster paced and then the “street French” pronunciation after I am familiar with the story. This audiobook has noticeably increased my comprehension of spoken French with relatively little effort on my part. I like to listen while in the car or anytime while waiting. Very convenient. 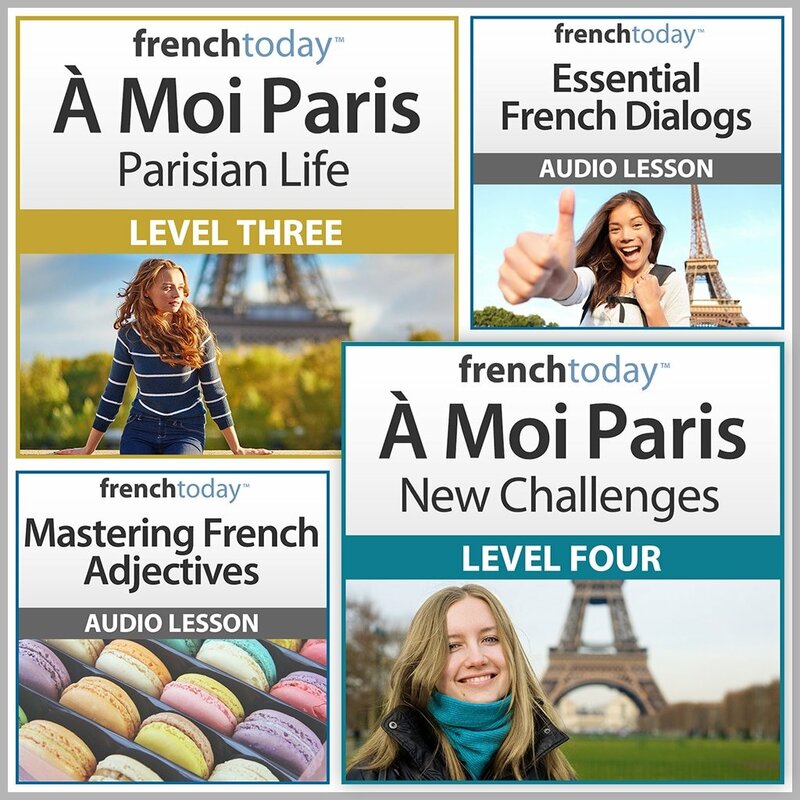 I have been in the business of teaching a foreign language at the US college level for over 30 years now, and I can state with confidence that French today and its audiobook series A Moi Paris is one of the best methods I have come across. Instructions are clear and comprehensive. I am looking forward to use the advanced levels as well. Great audiobooks and lovely idea to have a slow speed for learners. I love being able to read the text and hear the pronounciation. I also like the fact that it’s modern French. I do think it’s one of the best on the market. It’s not all perfect though: the ‘app’ doesn’t let you bookmark key pages (like where you got to last time), and it doesn’t let you track key phrases that you’ve found useful in an easy way. I also bought French with Alexa – which is good but I barely use it now, whereas I use French Today much more often. It’s not cheap at all – in fact I think a little over priced. But it is the best out there and a tribute to the French Today team. 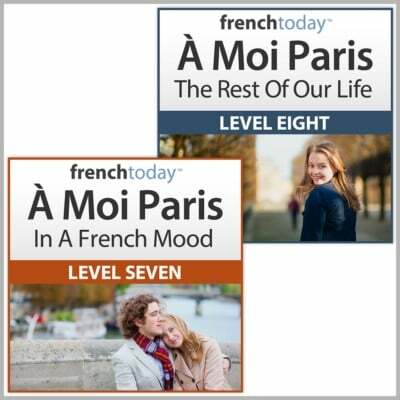 I have purchased Level 1 – 4 of the A Moi Paris Audiobooks and my French learning is greatly advancing. I love this style of teaching. Camille has a soft and calming voice and is easy to understand. Her method for instruction and explanation is excellent. I highly recommend French Today to anyone who wants to advance and improve their knowledge of French. I can’t wait to visit France again and try out my expanded vocabulary. I’m enjoying this product very much — I use the app on my iPhone while I exercise. I also purchased the higher levels, and I am looking forward to moving along in the series. I love this series it is easy to use on my iPad including the installation and is so helpful in hearing conversational French in an everyday setting. I would highly recommend this as a method of learning. Sound, inspiring, totally relevant. I have e books and verb drills and a few other things from French Today, they are all very good. Also I have seen three or four of the videos and they are also very good. I like “Les Crêps” Layla makes it seem so easy. The slow audio version of the books makes exact pronunciation easy to learn, whilst the normal speed I can mimic, once I know what I am aiming for. The fast version attunes my (English) ears to the sounds of the French used on the radio. The content is technically excellent; the teaching is inspiring, and all done within a realistic story line. Ten out of ten from me. What more could one want? I found this level easy to do because I have a basic grounding, but there were many snippets which I found interesting and informative, as well as totally new. Thanks, this was excellent, and I love the audio stories set to different tempos. Great idea, and superb for a not very confident listener. I love this series! Everything about them is top notch. I’ve been recommending them to friends of mine who are also learning French. A great deal for the price. I work on this program daily. It is very well put together with listening, reading, and writing. I have studied French for several years (independently). However, I am glad I followed Olivier’s suggestion and starting at the beginning. I am getting lots of practice in my weak areas–ie. spelling and pronunciation. A Mois Paris is the first course I have used on-line that is effective in helping speak and hear French rather than read French. I am having imaginary conversations with the characters in the story and getting more confident with each lesson. I use your program daily and often in the car on my way to a mountain bike (VTT) ride. I also use an online program at home. My daughter in law is a French professor at the citadel in Charleston SC USA. We have been to France several times visiting her family and so I try to learn French. I found it easy to jump into the lessons and learn very quickly. I work for a French corporation, and I’m already beginning to understand the memos that come from the company’s headquarters without having to resort to reading the clunky English translations at the bottom of the memos. Merci ! Excellent program. Well thought out. Excellent customer service. I am extremely pleased with this audio book series. I am focusing on French pronunciation and couldn’t be happier with my purchase. Camille’s tips, throughout the series, also explain how to listen to the spoken language. This is a great audio book series for anyone wanting to learn French. I am glad I found frenchtoday on Twitter. High quality sound recording, excellent voice/pronunciation (most important for me as a beginner), detailed work book, three different speeds of recordings to train your recognition of spoken language. This is a good starter for picking up French. I went through level 1 and I have a sense of French now for speaking, and some simple basic grammar. So excited by my progress in French… I just adore this french learning program. I have used other programs that were free for about 6 months,and that gave me a base for some vocabulary. But when I was ready to move on to sentence formation and speaking the french language correctly, it was your program that I was taken in by. I took advantage of the free 2 hour lessons you offer, and after completing them I was so excited by my progress in understanding and writing French, I purchased the “A Moi Paris” 1 and 2, best investment I could have made. Not only has my French dramatically improved, so has my English. Using this program has made me realize how slack my grammar has become in English. Thank you for all the hard work you put into your Frenchtoday programs and blogs. I absolutely love these audio books! You can learn at your own pace and they are easy to understand and follow. The extra notes after each chapter are very helpful. If you want to learn French the way it is actually spoken today, I recommend all of the products highly. Merci beaucoup French Today! I have found this audio book by frenchtoday to be an excellent learning resource for me as a beginner. The story line recorded at three speeds is very useful . Each person will have their own way of learning I guess, but I find it helpful to listen to each short chapter numerous times on the slow recording to the point where I really understand everything before moving on to the normal speed recording (again listening many times) and finally moving on to street French, which for an English guy living and working is France is particularly useful – repetition definitely is the key. In addition, the study guide section is excellent. Camille provides detailed explanations of the basic but essential fundamentals e.g. polite greetings, weather, time, numbers, days of the week, key verbs, family, food …and much, much more, all with worked examples and exercises pitched at the right level. There is hours and hours of study material. For anyone looking for quality, value for money beginners French learning material, do yourselves a favour, look no further and BUY this! Clear and right on the mark for beginners. I have a couple of the products from French today. It’s really good quality and I hope there will also be a video product, like Italianissimo (BBC) which became a school standard, and something with both audio, video and excercises for iOS. I wanted to learn french beyond what I experienced in Elementary school, and just so you know, I wasn’t so fond of school, actually I couldn’t wait for it to be done. Now, here I am, many years later, taking french once again, except this time I’m focused on learning. I spent some time reading reviews and liked what I read about French Today, and so far I’m not disappointed one bit. I like how it starts off with beginners in mind, and for me I needed a starting point like this. I was impressed by the written material and how it’s easy to follow, and the corresponding audio files. What a joy to be able to replay the audio at my leisure. Well, I could babble on, but writing is not my specialty, so I’ll just say thanks for an excellent product. I am beginning to accumulate a good collection of programs in the audio pronunciation, stories, verbs , etc…etc… that Frenchtoday has to offer. They are very educational, it has wonderful unique approach to immersion in the language. Not sure why it took me so long to find them. Yes, pronunciation is difficult, but with their methods, and encouragement and constant flow of free information on specific areas of the language, with clear concise explanations of how to use it, in the everyday conversations…What else can I ask for? They are friendly, respond to inquiries quickly…constantly reinforcing the practice… practice to learn to speak it. Have made progress, Love the lessons, specially the different speeds of the content. I personally would recommend Frenchtoday to anyone that wants to learn the French. I am having fun learning to speak French, specially now that I have found the right program. After four semesters of college French in the U.S., I was disheartened. But after just a month of frenchtoday, I’m reenergized. This is a GREAT way to learn to speak French! Your lessons are fantastic! I give it the highest rating. I’ve studied French on and off (with long stretches off) for years since I was in 7th grade. I retired a few years ago and decided to try to get more proficient, now that I have lots of free time. I came back to studying French using Rosetta Stone, which was excellent in getting me to speak French better. After finally finishing it’s five levels, I found I still had gaps in my grasp of the language, especially when it came to understanding spoken street French. It was nearly impossible to decipher the dialog in French films or overheard in the streets of New York–so fast and so much slang and idiomatic expressions. French Today has been very helpful with getting accustomed to the way French is actually spoken–the way words are contracted and the use of conversational phrases. I’ve not come across any other language course with this approach. Also, the study guides are the best I’ve come across in explaining some of the finer grammatical points. I’ve always wondered why some things were said one way rather than another, and your guides offers an understanding; that’s so much better than simply trying to memorize rules. I have been a beginning French learner for years. I always work on my basic skills for a few months before a trip, and I have used many different books, tapes (yes, that far back), CDs, etc.. This is by far the best program I have used. It is especially good for pronunciation. I’m not sure that it is truly for the total beginner, tho. I also find that the integration of grammar with the lessons is excellent. I may even finish this program before my next trip in June. Thank you for your glowing review Barry. You mention “I’m not sure that it is truly for the total beginner, tho.” but if you read other reviews on this page, you will see that many true beginners have really enjoyed this audiobook. “Level 1” was absolutely created for the true beginner in mind. Hi, We plan on living in France and had been looking for a course in French, we tried your free sample and were very impressed so we bought level 1. We have both found the structure excelent, John, my husband had a smattering of french knowledge, I had none. John who is much better at languages than me, has used many different books, CD’s and Internet courses and say that this is the best he has used. John is has now started on level 2. I on the other hand am still on level 1 but I find your explanations very clear and helpful and using the audio along with the written French is helping my pronunciation very much. This course goes beyond anything I’ve looked at. Camille and Olivier have crafted an amazing product which is presented so that the student hears French spoken at three tempos, from slow through to what is actually heard on the streets. It is clear,informative,and fun. In addition, the student is sent weekly interesting tips with videos of different facets of life in France. The customer service is exemplary also. This program is amazing. After studying in class and privately for 20 or so years [including university, Alliance classes and Rosetta Stone], and failing to progress with a natural flow, the French Today product is turning around my language development. Now, I can’t wait to spend time studying because I see, feel, and speak the results immediately. French Today addresses language learning the way a child would learn language….by listening first, and listening a lot before the printed word is presented. I purchased Level One because I had a lot of holes in my knowledge and to my delight, it was a good decision. I spend a lot of time in France and know more about the country and customs than my French born friends, yet I’m learning new things which I’m sharing with these French folks. The Study Guide is exceptional in its presentation. The audio is technically masterful in presenting the well organized material. In short, this is pure genius. These audiobooks are very helpful. Great mix of story to keep your interest and study guide to target learning. I uploaded the PDF to Kindle, so that I can highlight new terms and phrases as I listen, to make flashcards later. The audio is very helpful to train your ear and your pronunciation. I like the self-paced nature of these tools and find it an enjoyable way to learn. Love the product. Have tried all kinds of products over the years, including Rosetta Stone, and this one is easily the best. The combination of the audio and the supporting materials are perfect. I have purchased the two first audio books of A moi Paris and they are just wonderful. I did learn French in the past but this is something totally different. I learn on my way to work (45 min each direction every working day) in the car. The explanations of grammar and pronunciation are fantastic and comprehensive. I will surely buy the next two audio books once I finish these ones. Watch and repeat is the key to the way that I learn. So, for me, it makes good sense to listen and repeat whilst learning a languages. The spoken word is a mile away from the written word, especially in French, and there are so many words for the same meaning. This is why the audio is so helpful here, I can listen and repeat it over and over again, that’s how I learn. Plus plenty of explanations and examples for the understanding. I’m loving this audio book. I was a little hesitant to purchase initially because I just couldn’t find a decent teacher to teach me French how I wanted. And I thought what good will this book do? It took me a whole year to find the strength to buy it. And I’m glad I did. It’s very helpful to my French learning and I wa already at an intermediate level, but thought no harm in starting from the beginning to make sure all the foundation and understanding of the basics were there. I’ve already learnt so much that I really never understood fully before and I think it’s one of the better products in language learning out there. I am only on lesson 3 of the beginner Level French Today, but I already feel I have learned so much. I am a 62 year old Grand-mere, and a motivated student! I have been using Duolingo and Rosetta Stone. However, I was quite frustrated that after regularly doing my lessons for almost a year now, I was still unable to communicate with French speakers. I found myself dong just what Camille says happens, freezing up and trying to translate the simplest phrases from English to French. By then then those golden opportunities were lost. After completing just the first two lessons of French Today, and with much practice, I had an occasion to use the simple interchanges I had prepared. Success! I was able to greet someone, respond to his 1st question (“how are you? ), and ask how his wife was! Genial! It was wonderful! I continue to use the other two lesson plans, however, I feel I would be so much further along if I had STARTED with FRENCH TODAY a year ago instead of just a few weeks ago. It has filled in the gaps left by both Duolingo and Rosetta Stone, and I am anxious to put into use what I am learning be able to communicate with the many French speaking immigrants in our area, learning about different cultures, and forming new friendships. Camille, Merci beaucoup! We understand what you mean but the problem with your suggestion is that different people use the audiobook in different ways: your suggestion has the study guide first, then slow recording then normal (and no street version) whereas we suggest you listen to the normal recording first, then go on to the study guide. Based on their starting level, some people might be more comfortable starting with the slow version, some others might be interested in listening to the street version before the study guide, some might listen to the street version after they have completed a section… They are so many different possibilities (and study styles) that we can not pick a specific sequence. We believe the current ordering is the most flexible and logical for all different types of learners. After several attempts at another online language course, as well as early stages with more formalised training – Alliance etc – I am greatly motivated now that I have started using the French Today audiobooks. They are really well put together and gently move you upward. I am combining French Pronunciation as well as verb fundamentals and Conversation, and all slot together very well. Highly recommended. I recently bought this product from French today, so far I found it to be very helpful with my french language learning process, it is very comprehensive and has a very well thought of design to teach french, the tips that you get as you progress are so practical and helpful, it is always exciting and not boring at all so you feel you are so eager to go back and learn more, French is the second language that I am trying to learn and I am making progress slowly with the help of this product from French Today, I am very sure that I will buy all the other levels once I master the material that I have, I think it is absolutely worth buying if you are keen to learn French. I’ve been studying French for nearly 30 years now, within which time I have lived, worked and studied in France for a year and a bit, and I can safely say that French Today’s material is of the highest quality and practicality that I have seen. Keep up the good work! Your products are amazing. I could have started at the Level 4 but there is much to learn even at the beginning level and I don’t want to miss anything! My textbook level is much higher than my auditory comprehension level. This is just what you both understand and I am glad to be your student. I purchased the verb drills and other products too which are also very good and build one’s confidence. I was able to download all the products but then I had a “computer expert” help me put the audio on my mp3. Well, the PDFS got lost somehow and Oliver has been very helpful to get my files back in order. Thanks so much! After searching for the right course online to learn French, I found French Today. I liked the fact that Camille said she teaches the French that the people speak , and not just textbook French, so to speak. I bought the first beginner’s course, and really love it. I am only on Chapter 3, but I enjoy the course so much. Today, I even ordered another course, the French Greetings course. Even though I have not finished my first course, I still highly recommend French Today!!! i love these books they are so…. addictive and so easy to follow the story. Although i have choses level 2 i actually have all of them, they are great !! I am delighted with this purchase! I was hesitant at first as I am no longer young and it has been many years since my experience with school french. I am finding this method of learning easy and fun. I now have confidence in my ability to relearn this beautiful language. The teaching is precise, clear and enjoyable! Very well organized and easy to follow and learn. Both fun and instructive, an essential tool to review my school French from thirty years ago. Proved to be very practical and allowed me to converse in small talk on my trip to Paris. Very interesting and challenging introduction to contemporary French pronunciation. Really helped my listening skills ! The different reading speeds are a big help for people like me who struggle with oral comprehension. Very easy to get acquainted with the language after many years away. User friendly and practical. Combined with oral Lessons I was quite comfortable speaking in French within a short while and my preparation using these materials www a godsend when we arrived in Paris. Merci! I find this helpful and fun but I must say, I have been waiting for months to hear back regarding beginner Skype sessions. The wait list must be much longer than I expected. With French Today i have achieved more fluency than my completion of some popular French language audio courses, that in my opinion turn you into a phrase book. If you want to ‘feel’ the language and achieve the feeling of progression start with this course and download the accompanying booklet for reference. Like many mid aged people my French conversation was received with raised eyebrows and disdain by french friends…”NO BODY speaks like that ! ” . Now that my own children are learning French we have all gone back to the start using Camille’s audio learning system and we are all making great progress ! Camille ‘ s method of audio based learning supported by written transcripts and extensive study guides is intensive and extremely rewarding to use. She insists training to a fast automatic response with a good accent and it works ! I have already studied french basic grammar, but when it comes to listening or to speaking french, I am almost beginner. I consulted Camille which one I should have started, and she recommended this beginners one. I am glad that I have started from this one, since it could be good review, and still I could learn something new. The big positive part is for listening practice. Although I still have difficulties to listen and speak french, some French around me told that my french seemed been improved! I will continue to study Camille’s materials. Thank you Camille and Olivier! I am writing this testimonial from as far as Indonesie. I have none experience in French while I can consider myself good in English. Thus I have been looking to add literacy in another language. Having worked in French company for almost 3 years, sadly my French reached only to “Bon Weekend!”. Fortunately somehow I came across your website and I cannot tell you how much I love your products (I bought a bundle of three products for beginners offered at a great deal. How lucky I was!). I would like to tell you how much I am enjoying studying French with your audio book novels. I have worked through First Encounter and am now starting into The Beginnings. While still being far from bilingual, I have noticed a big improvement in my ability to read and understand the stories. My comprehension of real French people speaking is growing in leaps and bounds!!! I only wish I had more time every day to devote to my lessons! I have found this product to be very good especially with the work book. As with all the other lessons and drills I have from you everything is well produced, with first class explanations and quality audio. I would highly recommend your products and methods of learning. This has been a very useful product. It is easy to follow and has helped improve my French. The different audio speeds make is so much easier to reconize and learn words as a beginner. A Moi Paris The Beginnings and A Moi Paris 1 are very helpful and makes learning francais fun and encouraging to keep learning. I took French for 2 years in school (over 20 years ago). Unfortunately I only learned to read and write to a point and the first time I encountered a native speaker I was lost. Camille is so correct in stating to learn to understand and speak French takes many hours of audio and practice. 5 stars all the way, as not only do you have great material you also have a great teacher. Having real speed French vs. slow school tapes (yes back then we had tapes…ha) along with Street French is invaluable. If I only had this information when I first started, I can only imagine how much progress I would have made with those two years. Any questions are quickly answered and the focus on pronunciation is a huge plus. Like anything else it will take time, but I cannot think of a more efficient way to learn true French. Before I start my review, I must admit I’m not a beginner. I’ve studied French previously and continue to incorporate this beautiful language into my everyday life. With that being said, in order to master a language, one needs to acquire the core basics as early on as possible as they are the foundation of the language. The key to any language is mastering the basics first and then moving on to the more advanced parts. What makes Camille’s French methods so special is that she makes sure you master the basics first and then eases you into the more advanced parts of the language so you too can speak this marvelous language. If I had this book when I first started studying French, my road to speaking French would be far less rocky than it was. What I love most about this book is the different speeds of the dialogues. There are 3: slow, normal, and street style. You can train your ear gradually and improve your accent as you follow along. The story is charming and I’ve become a huge fan of this charming woman by the name of Mary. I hope we’ll see Mary in an advanced novel someday. Thank goodness Camille noticed the lack of quality French methods out there and actually did something about it. 5 stars all the way. Si vous utilisez cette méthode, je suis sûr que vous allez matriser la langue française. Sans aucun doute! What an invaluable find French Today has been. I recently attended a month-long French immersion class in France, and Camille’s lessons are the perfect way to continue my studies. Her instructions and progression are very similar to what I learned at the school and her beginning materials have been an excellent review to help me cement all of the concepts I learned (and understand a few that I missed at school since they only spoke in French; sometimes an explanation in English is really helpful!) I truly believe that repetition and speaking out loud are key, and Camille provides many opportunities for this. I especially love the exercises that ask you in English to say a phrase in French. It’s really improving my ability to think of the words I need to say/use. The recordings at 3 speeds are extremely beneficial and all are so well done. I’m still in France currently, and people are complimenting me on my (admittedly still beginner’s) French. Thank you Camille!! Can’t wait to get to the next level. (after lotttttts of review and repetition at this level :) Highly recommend! I have been working at learning the French language on and off for a few years now. I’ve tried classes, Rosetta Stone, and various online games and courses. This product, however, is absolutely the best. Being able to hear French spoken, see it written in French and then see the translation in English is extremely helpful. And if you follow Camille’s instructions for how and in what order to listen, you will make great progress. For the first time, I am actually being able to understand spoken French — even at a fast pace. The various speeds are particularly helpful. Once I got to Chapter 7, I realized my ability to listen had greatly improved. While I didn’t get every word on my first listen, I had a really good general idea of the content. As she says, it is important to review continuously, but if you do, you will learn this beautiful language! I’m not normally one to give reviews, but have made the effort to do so with this product as I have found it so valuable in boosting my confidence in stringing French words together into sentences with the proper, up-to-date pronunciation. I have done some other beginner’s stuff in the past, but being able to listen and repeat-out-loud at the 3 speeds, I have found that I am able to work out what has been said (at slow speed; I have even been able to work out some unfamiliar words from the context), and then I am starting to pick up hearing lots of phrases at the faster speeds. Lots of repetition required (remember- repetition is the key) but it has been really enjoyable listening to the progress of the story in French. With 1½ years of learning French under my belt, it is only after having gone through this book, along with “Secrets of French Conversation” and “French Greetings and Politeness”, that I am finally feeling good about speaking some French on my next trip to France.